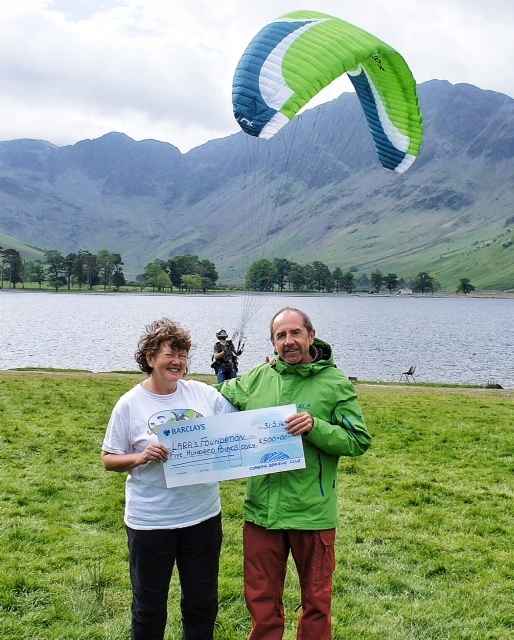 Saturday 31st May 2014 saw the annual Lakes Charity Classic, an annual paragliding event held by the Cumbria Soaring Club at Buttermere in the Lake District. Each year, this three day paragliding festival sees, amongst other things, a two day flying competition, acrobatic flying, helicopter and girocopter flights. The event is organised and funded by the Cumbria Soaring Club (CSC) who choose a number of local charities each year to which they donate the various proceeds of the event, including monies made from camping fees and showground entrance fees amongst other things. The CSC heard about Lara’s Foundation through the recent article which appeared in the Skywings magazine (link HERE) and due to seeing Graham, Lara’s dad, flying around the Lake District on his Lara’s Foundation paragliding wing, and chose the Foundation as one of the charities to benefit from this year’s event. Graham was at the festival to be presented with a £500 cheque for the Foundation. Thank you very much to the Cumbria Soaring Club!